I should make crepes more often. Maybe that can be a resolution for the new year. Crepes are so versatile. They taste great, too. 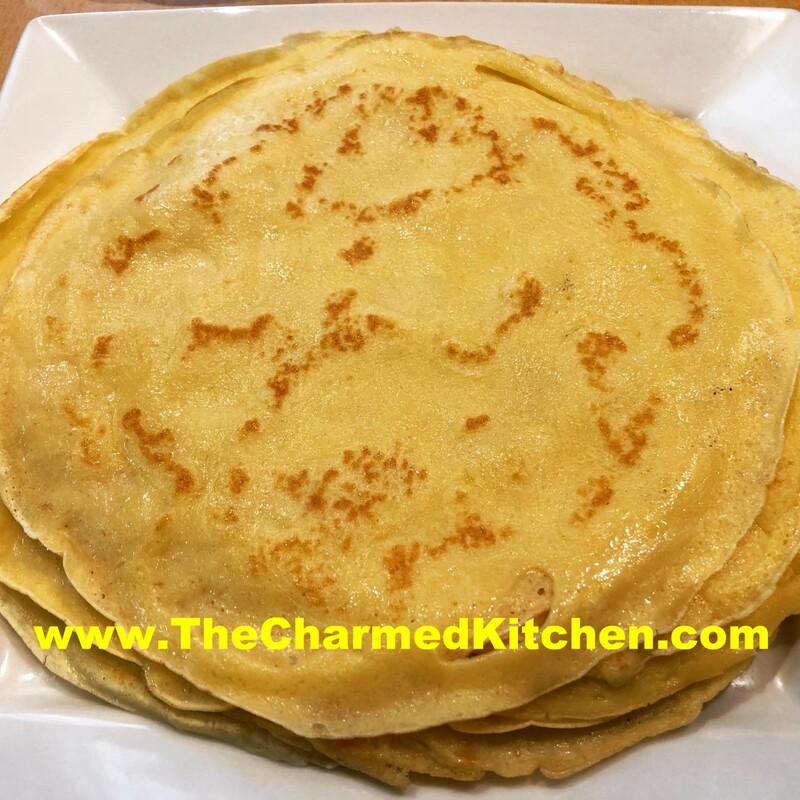 Crepes are one of those foods that everyone seems to love, but very few love to make them. I hear that all the time. There is some sort of irrational fear of crepe-making that I hope to dispel. Crepes aren’t hard to make. Once you make a couple, you fall into a sort of rhythm. I do. I use a tiny sauce ladle to portion out the batter. In it goes. I tilt the pan to get an even, thin coating over the bottom of the pan. It just takes a couple of minutes for the crepe to brown lightly. A flip of the spatula, another minute or two- done. Then on to the next. I always think about my Mother when I make crepes. I loved watching her make them. One after the other- all perfect. She said the first crepe never worked. She said there is a crepe “tradition” that the first crepe of the day always looks like an amoeba. So if this happens to you- just keep going. They get easier to make, I promise. You get into a sweet spot where the pan is the right temp, you are putting the right amount of batter in. Once this happens, you’ll have a stack of perfect crepes in no time at all. I made a classic recipe- the same recipe my mom used. 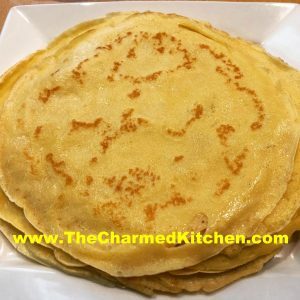 I have other recipes for crepes, but this one is a sentimental favorite. Crepes can be filled with either sweet or savory ingredients. I made a blueberry filling for some of the crepes , then used the rest as pancakes for mu shu duck. 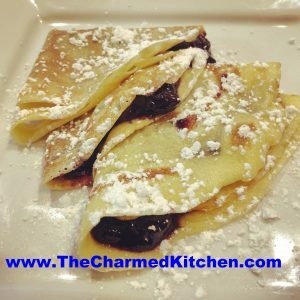 You can just smear the crepes with you favorite jam or jelly, fold and enjoy. So here is the recipe for both the crepes and the blueberry filling. Beat together flour, salt and eggs until smooth. Stir in melted butter and then stir in milk until batter consistency is that of cream. Let stand for 30 minutes before using, or can be refrigerated, covered, overnight. Beat again, just before using. Heat 6 or 7 inch skillet. Brush with butter or oil and pour in about 2 tablespoons of batter, tipping pan to cover bottom of pan completely with batter. Cook until edges start to brown, turn over and cook until lightly browned (about 2 minutes per side.) Remove to a plate and repeat with remaining batter. Crepes can be made day ahead. They can also be frozen. To freeze, layer crepes between sheets of waxed paper and wrap in plastic wrap of place in a freezer container. Freeze. . Makes 12. Crepes can be filled ahead or guests can fill their own. Fillings can be served warm or cold. These crepes can be filled with either sweet or savory fillings. To make the blueberry crepes: Lay a crepe on work surface. Spoon about 2 tablespoons of the blueberry compote onto one half of the crepe. Fold in half, then fold again to create a fan shape. You can also spread the filling all over and roll up the crepe instead. Serve dusted with powdered sugar, if you like. You can also serve with whipped cream or ice cream. Place all ingredients in a medium saucepan and cook, over medium heat, until berries soften. Continue cooking, over medium low heat, until most of the liquid has cooked off and mixture thickens. Stir from time to time, to prevent sticking. Watch more closely as mixture cooks down. If you like a sweeter product, you can add a little sugar. Set aside until ready to use. Can be spooned into crepes warm or at room temp. Makes about 2 cups.